Hi guys! The last of the 4 UCB single plates that got released recently, is the Love & Marriage plate, and today I have my review of that plate for you. And I used it for a swirly girly mani with pink and glitters! This plate truly offers anything Love & Marriage related, from lace and swirly designs to wedding bells and love potion nr. 9. The only thing that I can come up with that's lacking here, is a "will you marry me?" design. Having said that, in most relations it's the guy that proposes, and I have a feeling those guys wouldn't often go for the stamping route to do so =) The plate does offer options to announce your engagement, to have a matching mani for your bachelorette party, and also a bunch of designs that would work beautifully on the big day itself. I think a lot of brides go for a classic French mani? 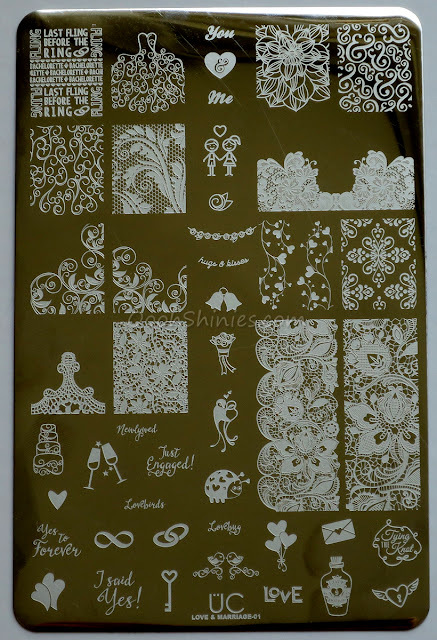 Imagine just a very subtle stamping with a swirly design, or a bit of lace to go with the dress perhaps, or bridesmaids with matching manis? But this plate also offers plenty for wedding guests, or for anyone that simply likes romantic designs of course! Essence Hola, Guapa with Konad White, Essence Silver Sparkle and UberChic Beauty Uc Love & Marriage -01.